http://BakingInATornado.com Baking In A Tornado – Queen of ALL Things Bloggy!! Let me set the scene for you…. Deanna has gone out the front door to put the trash bag in the can. I am sitting at the dining room table typing away on my laptop. She opens the front door to come back in the house. She then slams the door and has a look of absolute shock and horror on her face like she has just seen a horrible accident. Me – Are you OK? What happened? Deanna – I almost DIED! Me – OMGOSH! Come here! Are you OK? What HAPPENED??? Deanna – I was.. I was… ATTACKED BY A SQUIRREL!!! Deanna – OMG!! I think it was rabid. Deanna – I was just minding my own business and taking the trash out. I heard a scratching sound but thought it was a stray cat. I tossed the bag into the can and then a NINJA SQUIRREL jumped out. It almost got me. It jumped on the tree all upside-down and ninja-like! I could have DIED!!! Deanna – What’s so funny???? I was nearly killed by a psychotic squirrel!!!! LOOK! It’s still out there??? What was it doing in the trash can anyway??? Squirrels are herbivores! It was DEFINITELY rabid! Me – We do eat vegetables on occasion…..
Deanna – Not that often. Deanna comes running through the door. Deanna – It’s still out there! It’s trying to get me! I saw it trying to get into the chimney by my room!!! Deanna – Every since I had that dream about Big Bird, I just can’t look at him the same. Me – At least you didn’t dream that you had to shoot Dan Aykroyd with a crossbow in a biker bar! Hey, he was trying to kill me!!! So, I’m scrolling through Facebook and I happen to see a similar ecard to the one above. Only, this one didn’t have the German on it. I had to look that up. 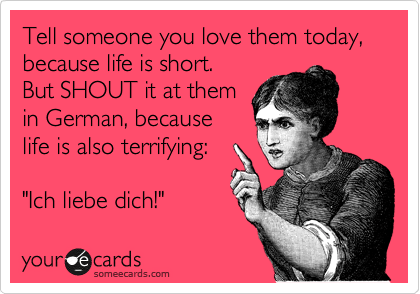 ANYWAY, I start shouting “ICH LIEBE DICH!” Scared Deanna half to death. It was awkward for a moment. Cailey loves all animals and I do mean ALL. She came in from outside one evening with a handful of slugs! She was having a good ol’ time playing with them…. UNTIL she realized how hard it was to get all the slime off of her hands. Me – What?? You’re not dumb! Deanna – Oh, you have NO idea! You just have NO idea about what I almost did! Me – Well, now you have to tell me. Me – Oh, yes! You can’t just say something like that and leave it hanging. Nuh, unh! You better spill! D – Well….. SIGH….. OK….. I saw that cute little kitty and I ….. umm…. was getting ready to try to call it out of the tv…. Me – *hysterical laughter* FLY ON THE WALL!!!!! 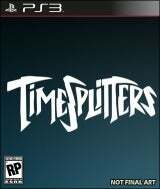 Jacob and Joshua were playing Timesplitters. Joshua – I kept shooting and shooting! I couldn’t figure out why I wasn’t getting any points! THEN I realized…. I am ON the red team!!! Joshua – I still can’t get over the name that Live gave me. SIGH….. Crabbyblock ***????? REALLY???? Cailey and Colin have a friend (we’ll call her K) over and they are running all over the house playing. I am sitting at the dining room table (yep, on my laptop) and Jacob and Joshua are in the living room playing a game. K – Spell i puppy. Cailey – I p u p p y. HUH??? Jacob to Joshua – That’s not even close! When we were kids we were cool. It was spell I cup. HA! MUCH better! The boys continue on in this vein for quite a while. Joshua – Googley Elmo invented the radio. Joshua – Yeah, Googley Elmo. Me – Marconi invented the radio. Joshua – Yeah, Googley Elmo Marconi. Me – OH, you mean Guglielmo Marconi. Joshua – That’s what I said. Googley Elmo! We are traveling back from Hilton Head when we see the above sign. My Dad – Hey! Look! There’s the Bat Cave! Colin – Na na na na na BATMAN!!!! Sooo… Jacob and Joshua were playing against each other on Just Dance 4 the other night…. They actually got into an argument over who did better. Joshua seems to have skunked Jacob on Rick Astley’s Never Gonna Give You Up, while Jacob trounced Joshua on Selena Gomez’s Love Song. Yeah…. It was a strange, strange night. The Fog at the Cabin in the Woods on Friday the 13th…. That’s where you can read the full story. Here are some of the parts that I left out. Me, practically standing in the creek while yelling up at my phone – JOSHUA, IF YOU CAN HEAR ME, WE CAN’T GET OUR CELLS TO WORK. 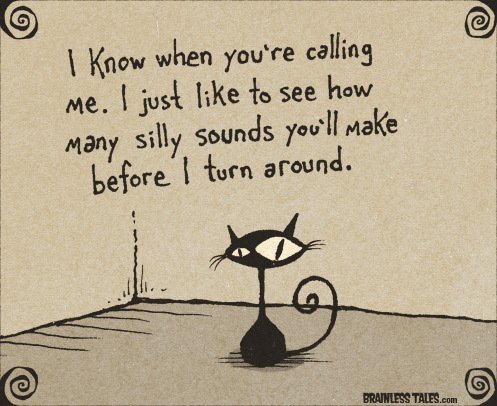 CAN’T CALL YOU!!! Me, putting the worms on the hook for Cailey. Yes, I can bait my own hooks. I just don’t like to if I can keep from it. BLECK!!!! Me, the look on my face the ENTIRE time we were there……. Deanna when she realizes no cell phone reception also means no wi-fi. Cailey and Colin when they realize no cable. Deanna’s face when she realizes that I was NEVER exaggerating about the humidity in Nashville. Poor Cailey at my mother-in-law’s house when her dog realizes that she is the only one scared of him. Poor Cailey was shaking like a leaf! Thor wouldn’t leave her alone. He’s at least part Min Pin. Sooo, it was a little late when we started heading back home. Deanna was riding up front with me and we may have had a little too much caffeine…… Everyone else was asleep, which just proves my theory that they can sleep through ANYTHING! So, did you make it through all of that? Still with me?? Then you most definitely want to check out the other blogs on the list. They are AMAZING!!!!!!!!!! My mom had this little dog that slept in the linen closet in the bathroom. EVERY SINGLE TIME my kids had to use the bathroom, the dog would growl at them and wouldn’t let them in. Dogs are mean……so mean. I really want to come join your family! You guys are hysterical. But I can’t stop giggling and picturing you standing in a creek yelling at your cell phone. On the other hand, I feel the pain of realizing there isn’t any cell service, cable or wifi. It cuts deep. You should have recorded your voices singing that awesome song! A deadly ninja squirrel, poor girl but it sure is funny! Love this! Of course I zeroed in on the squirrel story since I’m obsessed with them. Tell your daughter to carry around a bag of peanuts with her next time haha! LOL sounds like you have as much fun in your house as we used to when our kids were young and living at home. This post was funny but made me sad and miss my boys even more. Oh! That would be GREAT!!!! ROFLOL! !